Computer sound card - bad. Outboard USB DAC - good. For happy wallets, to South Korea go. 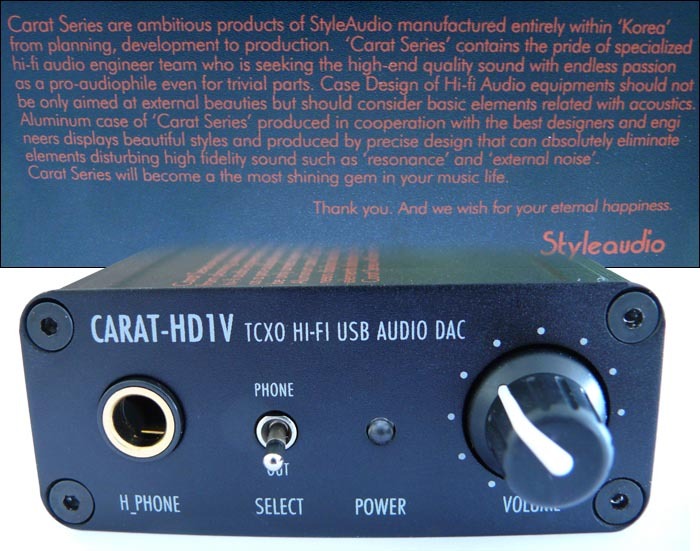 That neatly sums up Styleaudio's proposition for their Carat HD1V cigarette-pack audio extrusion. Think 9V 500~1000mA optional wall-wart power injector; USB in; analog out (and Toslink digital and 1/4" headphone); output select (1/4" or RCA/optical); volume control; and no batteries since this isn't mobile but desktop audio. 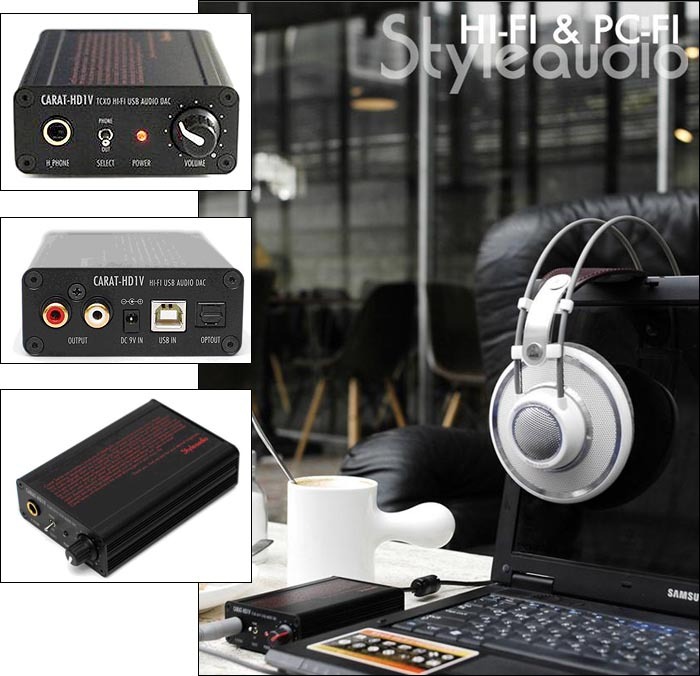 The Carat Series has already announced a mini pre and class D amp but at present, three different USB DAC/headphone amps are it - the UD1 and HD1 [below] and today's HD1V with upgraded parts. 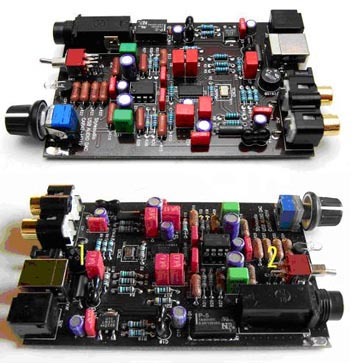 The HD1V's board houses MKP-level Wima and Sanyo Oscon silver mica, polypropylene and polyester film capacitors, Dale RN60 precision metal resistors, Burr Brown's OPA2350 chip amp and 32/44.1/48kHz 2704 DAC and a 1.5ppm TCXO temperature-compensated crystal oscillator for a claimed 98dB S/N ratio and low-jitter performance. The unit derives its power from the USB interface unless the optional AC power injector is used. 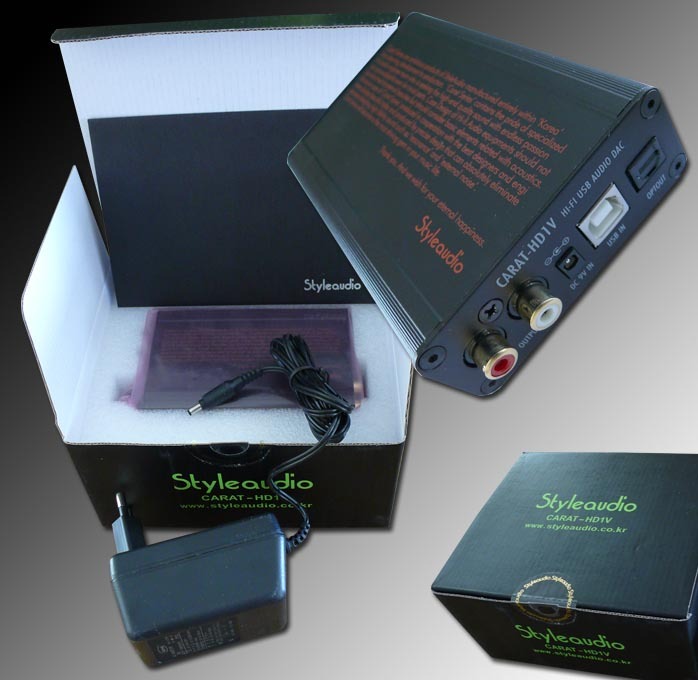 Styleaudio claims no drivers need to be installed on your PC or laptop to shake hands with the Carat via USB. Unless you run powered speakers of course, you'll still need an amplifier or else this is merely a headphone amp. My Windows XP computer recognized the device as "USB DAC" right away and I was up 'n' running 5 minutes after the mail man delivered the box. For the accessorizing crowd, Styleaudio has thrown in two spare volume control knobs so you can run a white or red - er, speed stripe. Wroom, wroom. Pull hard, pop, push and off ya go with your swapped control. As we saw with the NuForce Icon, presentation in this miniature lifestyle/PC audio segment is a big deal. Like perfume, it all starts with the external packaging. Styleaudio's black packaging could contain a mini tart from an upscale bakery. It's not primarily the hard-boiled audiophile who's pursued here after all but the trendy MP3ster. It is the firm's contention, however, that the premium goodies populating their board make this most gussied up of the Carats a bona fide audiophile proposition. Ever since Gordon Rankin of Wavelength Audio strapped a Macbook to a tube-powered USB DAC at a long gone CES, the concept has gained legitimacy. Imminent is the day when sources or preamps without universal serial bus will be considered hopelessly passé. To recap, Styleaudio is a Korean creative design group developing hifi and PC audio products where personal computers are viewed as digital music sources. Ted Lee explained: "Our mission is to provide the best bridge solution between fine audio and the personal computer. We are a young company. We introduced our first model in the summer of 2007 exclusively in the Korean market. After the launch, the market reaction was very high on our product and thousands of users talked about Styleaudio to where we're now No. 1 in Korea for USB DACs. We are planning to introduce two advanced new DAC products this June which will have various i/o functions to allow various combinations between personal computer and Hi Fi components. We are also planning a new headphone amp but all our product will maintain the current design concept and identity." "We have three different models at present, the Carat-UD1, Carat-HD1 and Carat-HD1V. However, the Carat-HD1 is being replaced by the Carat-HD1V so for the overseas markets, we focus on only two models, the UD1 as the lower and the HD1V as the higher version. The most important difference is the 1.5ppm TCXO and upgraded parts. To get good sound from computer audio requires a high-priced sound card. The HD1V's price is reasonable by comparison but to meet this target, we concentrated on audio with minimization and optimization. Usually high-priced audio devices that outperform PC sound cards offer various input functions. Even internal sound cards come with 'line-in' and 'microphone-in'. Our Carat series only outputs sound and only for two channels to lower costs, with the investment focused on maximized sound quality. We deleted all multimedia functions and spent money on upgraded audio quality. That is the point of our efforts. And because USB is used as power source, our Carat devices are most suitable for laptop sound solutions." Wavelength Audio's entry-level Proton USB DAC too relies on USB power as well, then adds a Li-Ion battery to support the DAC and headphone output. Their site contains helpful hints for Mac and Windows users of outboard DACs. Check it out. With my highly efficient audio-technica ATH-W1000 headphones, the Carat had me routinely at between 3-4:30 on the dial, i.e. quite close to maxed out, regardless of whether the optional wall wart was live or not. This leads me to be believe that the Carat would fail at driving the big Sennheisers. There isn't enough gain in the circuit. That said, the sound on my 'phones didn't seem malnourished. At all. The op-amp driver did an admirable job in fact, along the lines of what Ray Samuels' breast-pocket units have proven possible. I simply found it curious that in this application, I didn't hear a real contribution from the wall wart. So yes, powered purely via USB connection and used as a headphone amp on my Japanese wood-encased cans, the Carat served its mission statement well. That very little headroom seemed left above where the majority of my sessions occurred didn't bother me personally. It is, however, a vital subject to investigate with your favorite headphones to insure that this circuit has enough raw guts to drive them. "We recommend 24ohm to 65ohm headphone for the HD1V model. 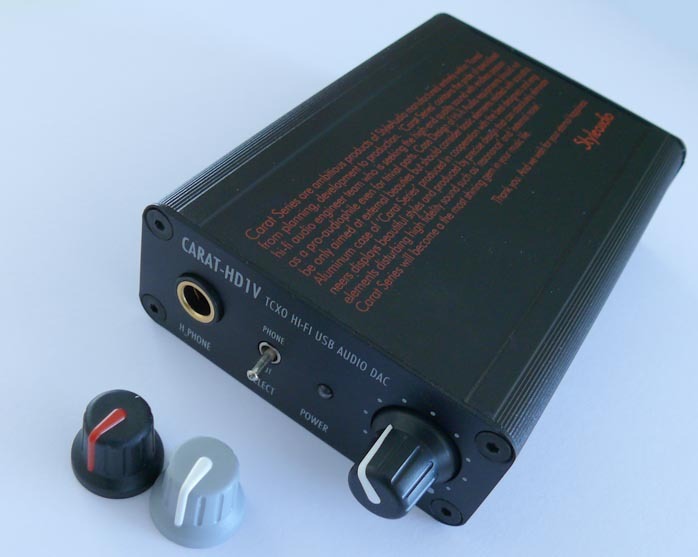 We are now preparing an SE version of the HD1V which will be suitable for over 300-ohm headphones. Regarding the extra power supply, many users in Korea report how it gives better sound quality. I think these cases mean that their notebook or personal computer supplies unstable power to the DAC." 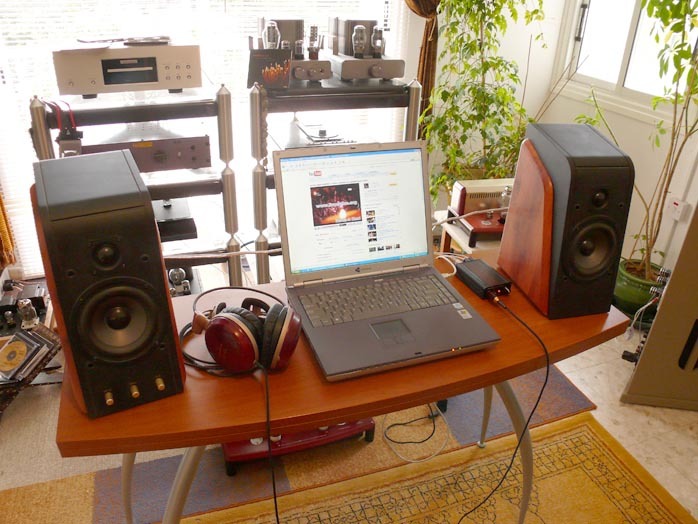 To investigate sonic performance as a digital USB converter, I inserted the Carat between my rarely used Gateway Lapdog (NEC ND-3550A DVD/RW drive, Realtek AC-97 audio driver) and Diva by Swans 5.25" 2-way powered desk top speakers. 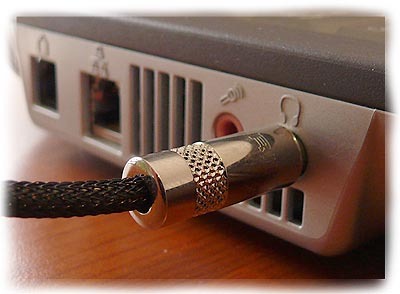 On my main work PC, those usually connect to its soundcard directly via 1/4"-to-2xRCA Zu Pivot patch cord. The latter was now replaced with Crystal Piccolo from the Carat's RCA outputs. Imagine my surprise to discover that in the 'out' position of the input selector, the Carat bypasses its volume control. 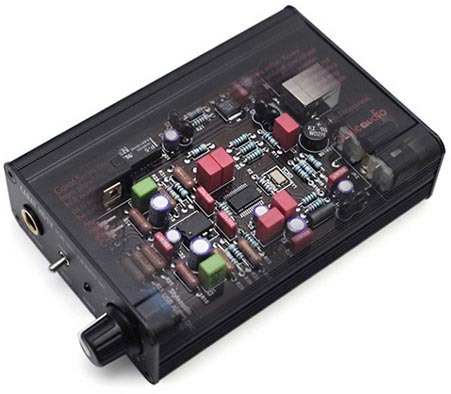 Explained Ted Lee: "Technically, the volume control could have a small but deleterious effect on the sound quality so perhaps the best way to transmit decoded sound from the DAC is at full output, without the volume control circuit in-between. But of course since many of our customers use headphones, we had to have a volume control. So the solution was to dedicate the volume control to the headphone output but run the RCA outputs unattenuated." I sampled the one and only Hüsnü Senlendiriçi via compressed YouTube streams (here with Zara, the debonair Ferhat Göçer sitting in the background) as well as the soulful Turkish singer Volkan Konak and Hüsnü's Greek alter ego, Stavros Pazarentsis. For uncompressed music, I spun my usual trade show compilations, then compared against the soundcard-direct hookup via the Zu Pivot's 1/4" headphone output connection. way for audiophile duties. The software interface to play loaded CDs was JukeBox or Windows MediaPlayer 11. Those who have done this type of comparison before won't be surprised to learn that whether streaming or spinning music, the direct feeds were far brighter, thinner and sharper. Only a true newbie -- and only for a short while -- would call that more detailed or compelling. Optimized for real-time streaming to avoid loading waits, the hyper-compressed YouTube feeds benefitted in particular though from an audiophile perspective, the Carat couldn't repair the inherent ills caused by wholesale stripping of musically relevant data. But if like me, you love to cruise YouTube to discover unfamiliar musicians (the major subsequent challenge is finding their CDs), you could call the Carat a near prerequisite. I absolutely adore the Turkish quanun zither, especially when played by masters like Göksel Baktagir or Aytaç Doğan. The instrument has a lot of harmonic brilliance that serves well to inspect how components handle it. I suspect that if anything, the Carat might be slightly soft on top which would be perfect for its intended application. The emphasis has to remain on suspect, however, since the Swans' soft-dome tweeters themselves might contribute to this impression. I'm not a habitual PC audio listener. My work desk is in the same room as the big rig. Game over for PC audio no matter how sophisticated. Hence I'm far less familiar with what the market offers in this sector. That said and looking at what the Koreans want for their Carat; and how good it sounds particularly over my W1000s which I know inside out from numerous high-quality headphone amps; I judge this mini box quite a success. I could wish for more circuit gain since I remember, from before I retired my Grado RS1s and Sennheiser HD650s, that my audio-technicas live on the very high side of sensitivity. If they tap into the Carat pot's last quarter for desired SPLs, I would think that a number of competing phones will need more power. Knowing how much go juice Ray Samuels harvests from his op-amp designs, perhaps Ted Lee will investigate alternatives to BurrBrown's OPA2350 for the Carat's pending SE version. As a USB DAC to feed powered computer speakers, the 200 euro clams Styleaudio wants for the Carat seem more than commensurate with the greater refinement and smoothness their gizmo brings to PC audio sessions. Contrary to expectations, I personally could not detect audible benefits to the wall wart to be hesitant recommending it as essential to this package. But the Carat solo seems excellent value and nicely put together (a stripped screw prevented me from getting inside for our usual closeups but VR Zone has some good ones). With the brilliant Aura Note Completer by April Audio my first encounter with Korean hifi, the Styleaudio Carat continues the story to prove that music and passion for good audio are global; and that fine specimens of the audio arts can be found anywhere. In fact, I'm presently talking with Emillé to show that Korea makes hifi contributions also at the very high end. Let the politicians do their thing. Music lovers and audiophiles can practice their own grass roots politicking by shopping across geographical and language barriers to bypass that other sad form of harmonic distortion. Here's to Korean audio ambassadors. While The Klezmatics are cranking out "Eyliyohu Hanovi" for a live bit of Hassidic Gospel Rock over the Carat, cheers!